TORONTO, Ont. 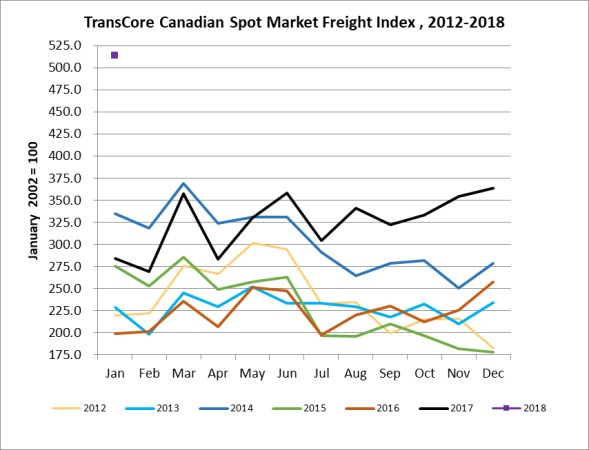 – TransCore Link Logistics reports that January spot market load volumes on its LoadLink load board reached an all-time high. 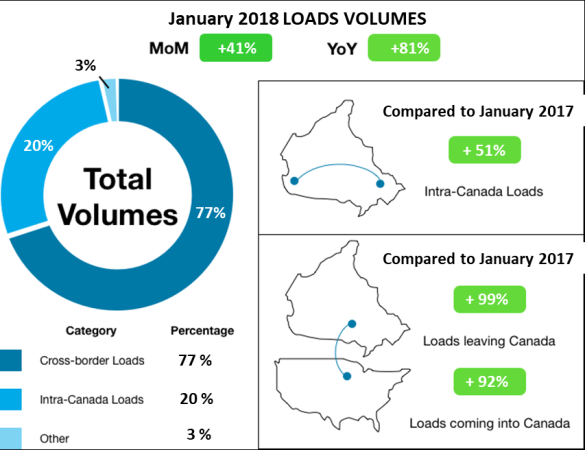 Canadian and cross-border load volumes surpassed all previous records, surging 81% year-over-year and 41% compared to December 2017. Intra-Canada loads accounted for 20% of the volume, and reached a 51% increase year-over-year. Cross-border load postings represented 77% of the data submitted by LoadLink users. Loads leaving Canada to the U.S. were up 99% year-over-year, while loads entering Canada surged 92%. Meanwhile, equipment postings declined 5% from December 2017, and were down 27% compared to last January. The truck-to-load ratio, TransCore reports, indicated 0.85 trucks were available for every load. That shows capacity tightened from the 1.14 ratio in December, and 2.10 trucks in January 2017.